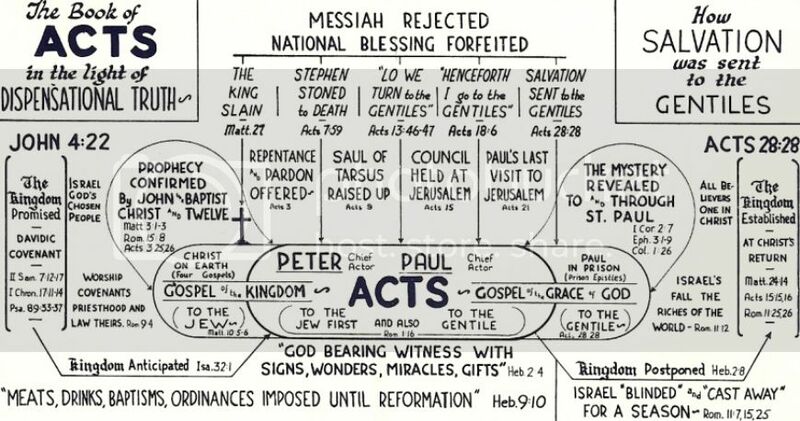 This Bible Study Chart illustrates that, with the rejection of Israel of The LORD Jesus Christ and His Kingdom, the message of the twelve Apostles went from the particular to the general. 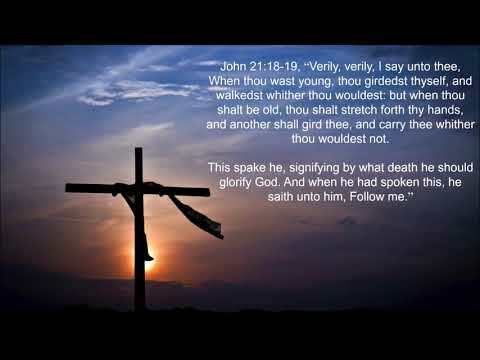 While LATER, with the Apostle Paul, (the chief of sinners saved by Grace), his message, (received by direct revelation from the Glorified Risen Christ), went from the general to the particular again, climaxed by the glorious Truth about Christ and His Body, The Mystery. Thus the TRANSITION lies BETWEEN and explains the generalities in the Book of Acts which have puzzled so many! The Greatest of ALL Commissions: Bible Study Illustration Chart 6 - Pastor David. 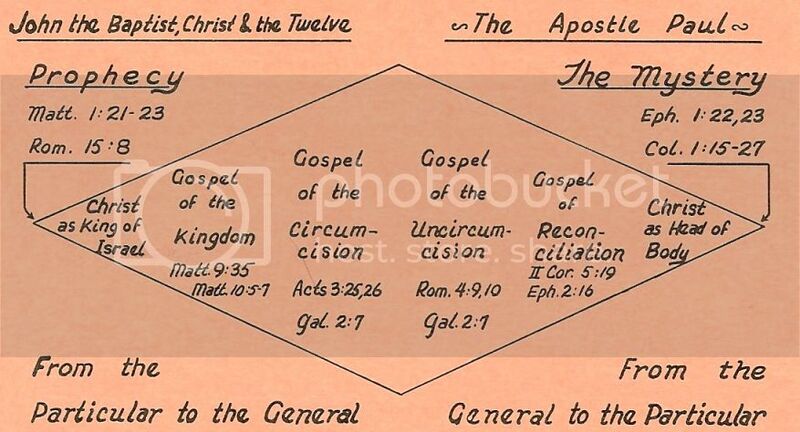 This Bible Study Chart illustrates how the so-called Great Commission was PRECEDED by a commission almost as great and then followed by the Greatest of ALL Commissions...THAT given by the Glorified LORD Jesus Christ to Paul, the Apostle of the Gentiles, and to us. Actually, while there is much talk about...obeying the so-called Great Commission...NO ONE really obeys it today, for God has made this impossible. This Bible Study chart illustrates the philosophical harmony of the messages proclaimed by God's servants through the centuries. For example, the Gospel of the Kingdom, proclaimed by our LORD and the twelve, NATURALLY takes us back to David and the great covenant of the Messianic Kingdom made with him. Similarly, the Gospel of the Circumcision, proclaimed later at Pentecost, NATURALLY takes us back to Abraham and the covenant of circumcision, guaranteeing the blessing of the Gentiles through the seed of Abraham, NOT Abram. Study the rest for yourself until you get to the most blessed message of all, The Mystery. The Mystery, proclaimed by the Apostle Paul and based, NOT on covenants, or prophecies, but based on God's own purpose and Grace given us in Christ Jesus BEFORE the world began. 2 Timothy 1:9. During the last few years Christians have been warned time and again against Dispensationalism, Ultradispensationalism, Hyperdispensationalism, and Extreme Dispensationalism. Some ignorant, spiritual leaders have warned their followers against any and all Dispensationalism. 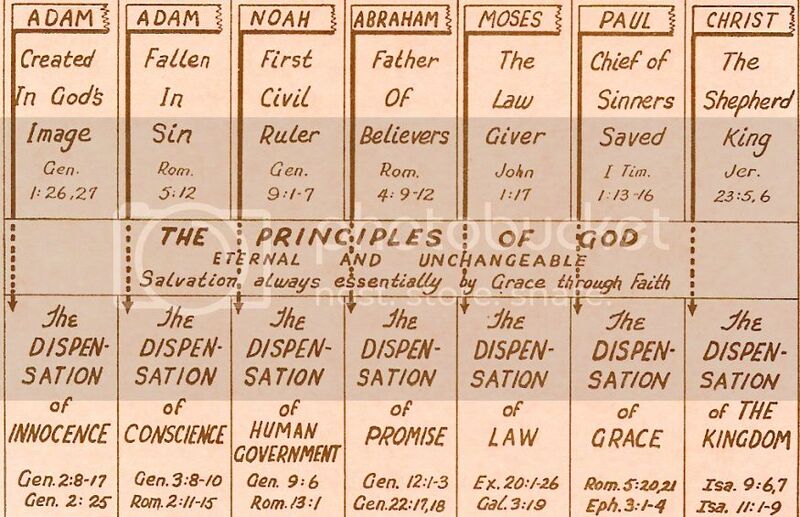 Now, the word "Dispensation" is used in Ephesians 1:10, Ephesians 3:2-3, Ephesians 3:9, Colossians 1:24-26, and 1 Corinthians 9:17. The Greek word is "OIKONOMIA" . . . "Oiko" means House . . . and "Nomia" means Law. IT is also from where we get our English word Economy. This word "OIKONOMIA" is translated "Stewardship" in Luke 16:2-4. 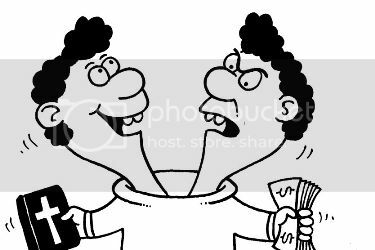 You see the word has the meaning of "The ADMINISTRATION of a HOUSE or HOUSE HOLD. I am sure you have heard of...The President's ADMINISTRATION. In Ephesians 4:12 we read that God is EDIFYING THE BODY OF CHRIST. OK, now, "EDIFY" in the Greek is "OIKODOMEO". "OIKO" means House, and, "DONIEO" means Build. The House of God, which God is building in this age and DISPENSATION OF GRACE (Ephesians 3:1-4), is called "THE CHURCH OF THE LIVING GOD; Without controversy a GREAT MYSTERY. (1 Timothy 3:15-16, Ephesians 5:31-32). Then, this HOUSE OF GOD, in Ephesians 3:6, is called "SUSSOMOS". "SUS" which means Joint, and, "SOMA" which means Body. God is building a "JOINT BODY". What is meant by "Joint Body", (because all of those IN Christ are ONE in Christ, ONE Body), is that both Jews and Gentiles as individuals are being added to the Body WITHOUT distinction, HENCE the Joint. So, in the building of this "CHURCH OF THE MYSTERY" (Colossians 1:24-26) unto Paul was committed "THE DISPENSATION OF GOD" (Colossians 1:24-26), and he was ordered by the risen Christ to "MAKE ALL SEE WHAT IS THE DISPENSATION (not fellowship) OF THE MYSTERY" (Ephesians 3:9). So the Apsotle Paul declared himself to be the Lords "WISE MASTERBUILDER" (Architect) who had laid the foundation. (1 Corinthians 3:10). Surely then you must see that no Christian can obey Ephesians 3:9 and make others see "WHAT IS THE DISPENSATION OF THE MYSTERY" or obey Paul, in 1 Corinthians 3:10, and build together on the foundation that he laid, without being a DISPENSATIONALIST. So we see that surely no intelligent, spiritual, student of the Scriptures, led by the Holy Spirit, after reading 1 Corinthians 3:10, Colossians 1:24-26 and Ephesians 3:1-4, would or could believe that the foundation that Paul laid was the same as the foundation that Peter and the Eleven (Acts 2:14) laid on the day of Pentecost.